Posted September 4, 2017 by Diane & filed under Story Bites Writing Prompts. Bayeux Tapestry – Scene 51 (extract)- The Battle of Hastings: Norman knights and archers. In this story bite writing prompt, let’s talk about character. Characters are the very first step in making a story come alive. Think of this statement: In 1066, the Battle of Hastings determined England’s fate. Men from France battled men from England and won a decisive victory. Okay. That’s a fairly accurate statement. But now let’s try this: On October 14, 1066, the fierce and crafty William of Normandy landed on England’s southern shore, determined to take this country for his own. He did so after a swift and fierce battle, in which his army felled the desperate and exhausted English King Harold Godwinson—with an arrow into his eye, legends tell. In the first statement, we have facts. That’s fine, but in the second, we have not only facts, but also two characters, a battle, and some personality. Yet it’s only the start of those characters: We can go a lot farther. So let’s go farther. Let’s put yourself in this story. William of Normandy has just landed on a sandy beach on England’s shore and is organizing his army to set forth and conquer. 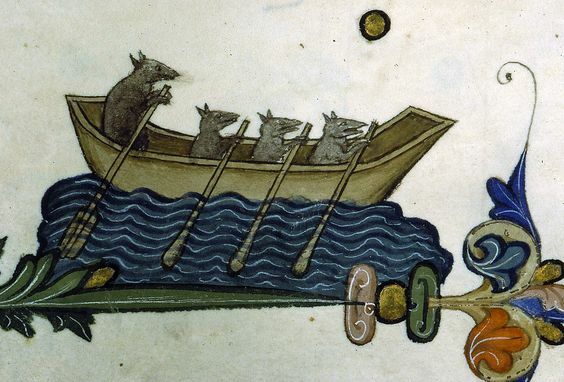 You’re not William of Normandy, however; you’re a rat that’s just run off from William’s own ship and is panting on the beach with William’s army pounding around you. Maybe a rat like one of these? This is an image from the Pontifical of Guillaume Durand, Avignon, made before 1390. The manuscript is at Bibliothèque Sainte-Geneviève, Paris, ms. 143, fol. 77v. What is the rat thinking? What does the rat want? What does the rat see, feel, and smell? What is the rat about to do? What happens when the rat does it? What does the rat look like? What color is its fur? Does it have all its whiskers? Does it have its full tail? Is the rat alone, or with another rat? How does that—being alone or having someone else—make the rat feel? For this story bite, write a paragraph about that rat. Use any or all of the questions above, or create and answer your own. And go ahead and give your rat a name if you’d like—or not. It’s your character. And once you’re done, please share it with me! Submit your story bite to me through your teacher, with your school email address, or with a parent’s home email address and include: your first name, grade, school’s name (or if you’re homeschooled, write “homeschooled”), town, and state.